Margery May left this world, at the end of May, aged 91. She was born August 1, 1924, on Bainbridge Island at Rolling Bay, in the house of her grandparents on Logg Road. 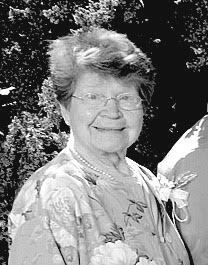 Her father George worked in the Palouse Country wheat fields of Tekoa, Washington, on the Idaho border, where her mother Edna May kept house and raised children. Margie spent her early years there before moving to Bainbridge Island in 1933 and later to West Seattle, where she attended junior high and high school. During the war, Margie met a sailor and, at age 19, married Frank Louis Noson from Aurora, Minnesota—the date was April 22, 1944, later to be the code for her garage door opener. Together they raised three children — Dennis, Nancy (Leach) and Gregory. As the wife of a career Navy man, she always made each new military assignment a home — in Long Beach, San Diego, Ewa Beach in Hawai’i, and finally back to Seattle in 1960 after 20 years with the Navy, setting up their home in Des Moines, Washington. They lived there together for 25 years, ushering their children off to college, adding new cabinets to the house, going out to dance the polka. Margie and Frank were granted only a few, well-spent retirement years, with non-stop travels, even going around the world and then around the United States, before Frank’s passing in 1986. She invested the last 30 years of her life in service as a volunteer for the USO, and a worker at the voting polls. Margie was a do-it person — gardening, as her mother did, in spring and summer, canning in the fall, knitting in winter, quilting in spring. This creative gene she passed on to her six granddaughters — Anna, Kate, Ann, Julia, Alena and Shannon. She is survived by her three children, six grandchildren, and two great-grandchildren (Sonja and Finn). And also by many nieces and nephews here in Puget Sound Country and east of the Cascades, as well as Minnesota and California — in all, they seem too numerous to count, but all counted to her. Mom once told me, about 9 or 10 years ago, i.e. in 2005, on the way to her doctor appointment in Renton, "Oh, when you were a baby we lived here." She pointed directly at a small 1940s house on the north side of the street. We were driving west on S. 176th Street, near the airport, heading to Pacific Highway 99. I said, "Why didn't you ever mention this before?" You see, in 1960, we lived in a rental home on S. 188th Street, by Bow Lake, less than a mile away and never a word back then. This is part of who Margie Noson was. A puzzle and a mystery. I miss her so. --Denny (known to mom, as I grew older, as "Denn"
Beautiful dedication to Marge and her family. I wish I had had more time with her. She did introduce me to her love of growing herbs...The Herb Companion no longer in print. I have saved them all and imagine the talks we could have had. I first met Margery at a Logg get-together at my maternal aunt's house on Sunrise Drive on Bainbridge Island (north of Logg Road). My aunt was Evelyn Logg Tyszko, and I believe the occasion of the gathering that day was because her uncle--Dave Logg--was up visiting from CA. So, of course, Margery was invited. It's likely that at one or more of the Logg gatherings on the Island, Margery played alongside Auntie Eve and also my mother, Milly Logg Woodward, on the Rolling Bay sand flats. At any rate, at that gathering that day, Auntie Eve took me aside and introduced me to Margery. What I remember the most was her friendly warm smile. Years later, she and I exchanged genealogical information on the Loggs. And one day in the library on the Island, I met her daughter Nancy. I have since come to love that branch of the Logg tribe. Glad I got the chance to meet you Margery, and your friendly warm offspring, just like you. i most remember the many weekend trips form north seattle to Noson household and getting together with all the cousins. playing in the yard and board games, like war, inside and bowling in the garage. Marge was alwayS very friendly and fun WIT A GREAT SMILE. and miss those fine times when we were all younger..